If there was ever a time to resurrect Wall Street, or at least turn it into something resembling a franchise,that’s now. The market is a mess, the public is fuming, and you have to hate Gordon Gekko’s (Michael Douglas) nonchalant, calm demeanor between it all. He’s despicable and untrustworthy, more relevant a character now than he probably ever was. That’s also where Money Never Sleeps gets it wrong, humanizing him in a way that takes the focus off his immense “greed is good” schtick and trying to turn him into a family man. The cast can handle it, an awkward dinner as Gekko tries to establish a relationship with his estranged daughter Winnie (Carey Mullugan). You believe that’s Gekko at the head of the table, still a bit seedy even when reconnecting with family. Performance or not, where it takes viewers is not where Wall Street should go, the focus now on a new villain, Bretton James (Josh Brolin), hiring Winnie’s soon-to-be-husband Jake (Shia LaBeouf). The entanglement of these finances as the market crumples around them is intense, no doubt aided by the reality of it all. The mounting pressure is a constant threat, and the reaction is where Money Never Sleeps prevents itself from being completely written off. It makes more missteps sure, bringing back Charlie Sheen for a brief cameo that sets a rather odd, lighthearted tone, an update better handled through some light dialogue elsewhere. The talent handling this, Oliver Stone behind the lens for one, ensures it doesn’t falter. The mantra of the original, that deep-rooted greed, is still well entrenched, the various firms ignoring a possibility for limitless clean energy for the sake of their own oil contracts. It’s infuriating, fiction or not, seeing these people act like they do. It makes their fall all the more satisfying, the ultimate karma reserved for those who put themselves there in the first place. The lapse in time between sequels has assuredly brought about plenty of visual trickery. 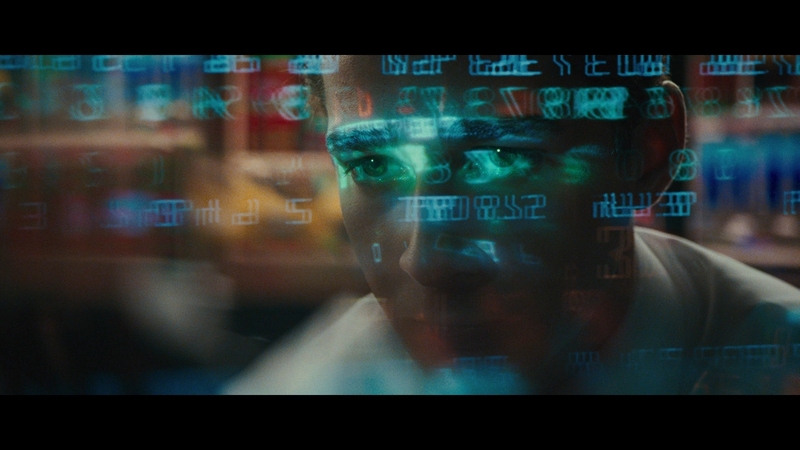 Numerous scenes feature either background special effects that could easily go unnoticed or stock tickers scanning across the live action. It’s nicely contained, never overboard or too much, right on the level where it creates an interesting dynamic within the visuals. Money Never Sleeps is very much its own film, even if Gekko allows the dots to be connected loosely. Money Never Sleeps is a great looking movie in terms of texture and detail. The AVC encode from Fox produces substantial layers of high-fidelity detail, close-ups always outstanding. Douglas’ aging face is loaded with wrinkles, adding a layer of stress to the character in a way that makes the added definition important. Medium shots are equally strong, preserving an adequate level of facial detail and clothing texture. It has moments of fault, the digital intermediate seemingly causing a level of smoothness that can be grating at times. LeBouf’s otherwise well-rendered face flattened for a crucial final scene inside an office at 1:50:39, the drastic difference standing out. For its few lapses, the city aerials even things out. From the opening credits, New York is represented beautifully, those towering buildings razor sharp, those fine lines catching no issues of note. There’s one off-moment of aliasing on a desk at 58:36, odd again considering how well handled those exteriors are. Black levels are rich, darker interiors like the charity dinner producing a slight crush. Shadow detail is otherwise well preserved. The image offers excellent dimensionality. A light level of grain is always evident without spiking, the encode handling it with no visible artifacts. It’s natural and clean, a winner in this regard from Fox. Where this one turns ugly is the coloring, the flesh tones outrageously warm to the point of being unnatural. It’s standard modern Hollywood fare, sure, but seems especially out of place here. The less said about those oppressive blue/teal backgrounds the better, at one point the smoke coming out of Gekko’s cigar turning a bright blue tint as if it was filled with food coloring. Few other colors have a chance to shine, the presentation by Gekko to some students one of the few moments where some primaries have a chance to show themselves on the clothes of the audience. It’s easy to write off a movie about stocks as some dialogue-driven drama, leaving this out there as a lean DTS-HD effort, but you’re only partially right if you think that. This is actually a fairly lively affair, those busy rooms full of financial advisers overloaded with extensive ambiance. Subway scenes capture not only the underground echo, but passing trains in specific channels as they soar by. The most impressive moment comes as some metaphorical dominoes begin toppling over at 1:21:25, the effect panning through the sound field in a circular motion that rapidly speeds up, the effect never lost. There’s a motorcycle race not long after that presents some excellent tracking as the bikes pass by on their cruise. There are a few moments of fault, one of them a conversation inside a zoo keeping any and all animals calls strictly in the stereo channels, odd considering how great everything sounded not long before. Dialogue is fine, and the soundtrack/score are both prominent without being overwhelming. There’s enough of a bleed into the rears to be noticeable and not drown out anything important. A commentary leads the extras with Oliver Stone going solo. He joins a large section of the cast though for a nearly 16-minute chat about the original film and the sequel. Money, Money, Money is the main documentary, split into five sections detailing the Gekko character, real life financial crisis, and the first movie. Some deleted scenes offer an optional commentary (Stone again solo), and some In Character segments let the cast discuss their roles. The disc has some trailers and BD-Live access left.